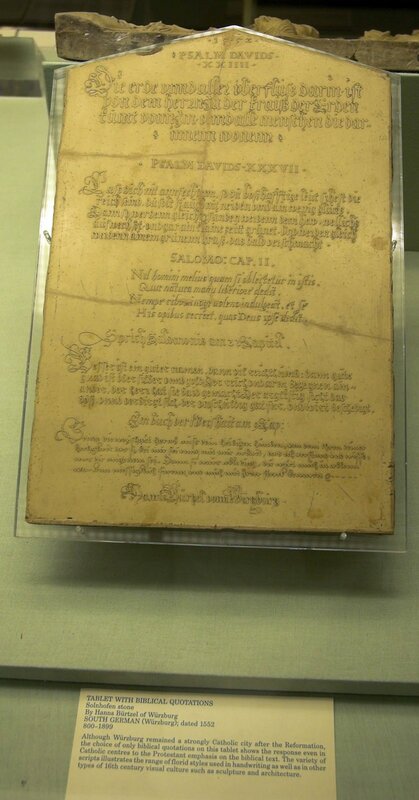 The plaque at the bottom of the photograph notes the choice of primarily canonical texts (as opposed to deuterocanonical, or “Apocryphal”, texts) as reflecting the influence of Protestantism in a city that remained a Catholic centre even after the Reformation. Interesting! I thank Robert for his excellent gift and I look forward to being able to read those parts of it where the script is large and clear enough to be legible. I also encourage everyone to see the original post, on Robert’s blog, where he has other photos from his day and a short commentary of his experiences.